Caple double built-under ovens offer versatility in the kitchen, allowing you to cook at two different temperatures at the same time. The clever design also means you can fit a double oven underneath the worksurface, giving more space around the kitchen for other appliances. 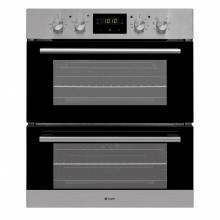 All Caple Double Built under ovens have A-Rated top and bottom ovens as standard. A 2 Year Manufacturers Warranty is provided as standard to give total piece of mind.